Shortly after the heat has given room for a breeze, we leave Austin and accompanied by a wind coming in from the south, we set aim for a lesser known adventure about half an hour drive east of town. All we know about the place is that it was the location for a few scenes in the 2003 remake of Tobe Hoopers 1974 classic horror movie The Texas Chainsaw Massacre and that there might be a chance for a couple of steps on the dance floor–an inescapable element accompanying me in my search for the true Texas. Our primarily search tonight is to delv into barbecue culture. Music, dancing regulars and proud pitmasters, all gathered together under the roof of an old smoke fragrant, skew and dusty old building out in the country. 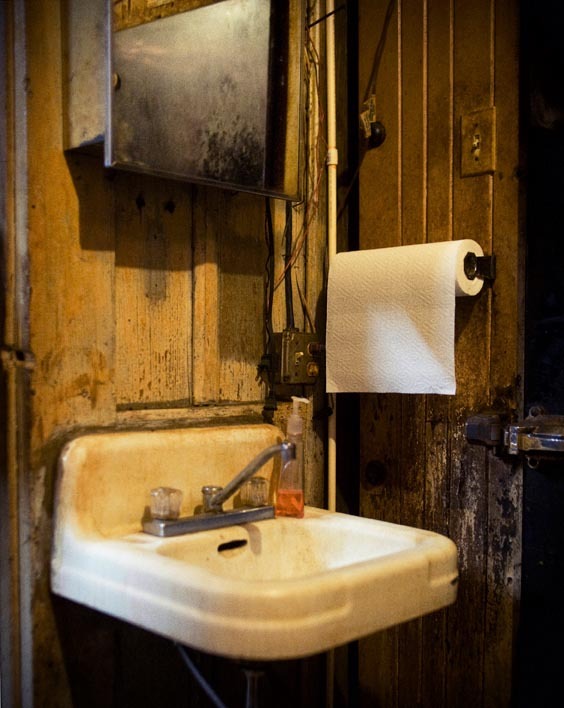 We hope to find what we’re looking for at what used to be the Richland Saloon, carrying a history dating all the way back to 1891 when this town inhabited roughly a hundred souls – about a hundred more than today. We roll in to the tiny town of Cele, anticipating oak smoked brisket, sweet ribs, and home made links, all served with wonderful sides such as pickled jalapeños, raw onions, and good ol’ barbecue sauce. Hot air swirls over the hood of the car, finding its way through the rolled down windows where it mixes with clean country air refreshing our city polluted lungs. Fragrance of smoke, music and a welcoming murmur from an open bar–an invitation to more. The night won’t deny us our need and provides an opening to dance, but first we need to satisfy our want for food. The routine here is to order the day before you arrive so we already knew what cuts of meat to expect, but little did we know how heavenly it would be presented and how great it would taste. What I’m talking about is the, for me, necessary combination of setting and repast. A six star top rated plate at Franklins in Austin in all it’s glory, but a four star rated one at a place with ancestry and atmosphere like what we found at the Cele Store shoots the experience into the memory bank like a dart hitting bulls-eye–to forever stick. The band playing sounds pretty good and feeds us a real inviting blend of country tunes. The audience is already in full swing, dancing and singing along to such an extent you can almost hear the ice cubes in the beer coolers rattle along to the music. Sitting at our table in the back room, we can’t help but feel the rhythm peregrinate from the old wooden floor up through our feet, legs, hips and hearts all the way up the the dance centre of our brains. Great expectations and an awakening restlessness makes me hit another Shiner Bock, and then another one. Cele Store is a beer only bar but you’re welcome to bring a bottle of wine or two if you like, just don’t forget to pay the cork-up fee. And be generous with the tip–won’t you! We leave a cluttered dinner table to have a couple of hours to swing our wobbly legs to the Cele House Band. Conspicuously well located right by the opening between the dining room and the bar sits a sink giving me the chance to wash my greasy hands before I tenderly put them around my lover’s waist. 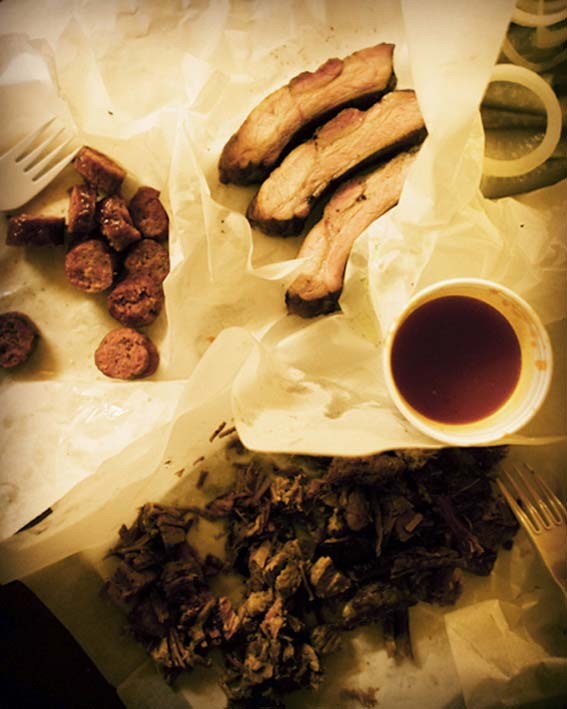 We dance for as long as the band wants us to and if you worry about real good barbecue being made from the fattier cuts of meat – please don’t. Dance it off and enjoy!